acheive my aim of finishing my 3rd marathon happy! beat my previous best time by 20 minutes. enjoy (most of) it and feel good. run (practically) all the way. I hope to be excused a brief section in the middle of the last mile in the face of a (by that stage) 40mph headwind when it really was quicker to march/stagger. discover that Oreos are the perfect marathon fuel at 21 miles. So I reckon that does make me a winner. *The benefit of multiple laps is the support of other runners. Lots of thumbs ups, well dones and waves as we passed each other and the front runner lapping me on his way to finsh telling me well done, keep it up. There was definitely a pattern to it on Sunday. Happy and encouraging others on the way out with the tail wind and then battling back into the wind with a grimace receiving encouragement. It was great to run the first few laps with Louise who I ran my first marathon with, see Cassie smiling through a tough first marathon, exchange ‘ looking good’ and ‘we can do this’ with Helen and get a big hug on the last stretch home from Cathy who came to support. **It started windy and got very very windy. The adverse weather conditions actually gave me something real to moan about rather than worrying about imaginary niggles and made me bloody minded and even more determined to be strong and tough it out. ***It was a small field and many runners were on their second, third, fourth or fifth marathon in as many days, but shh… we won’t tell anybody that – I’m making the most of it because it won’t happen again! 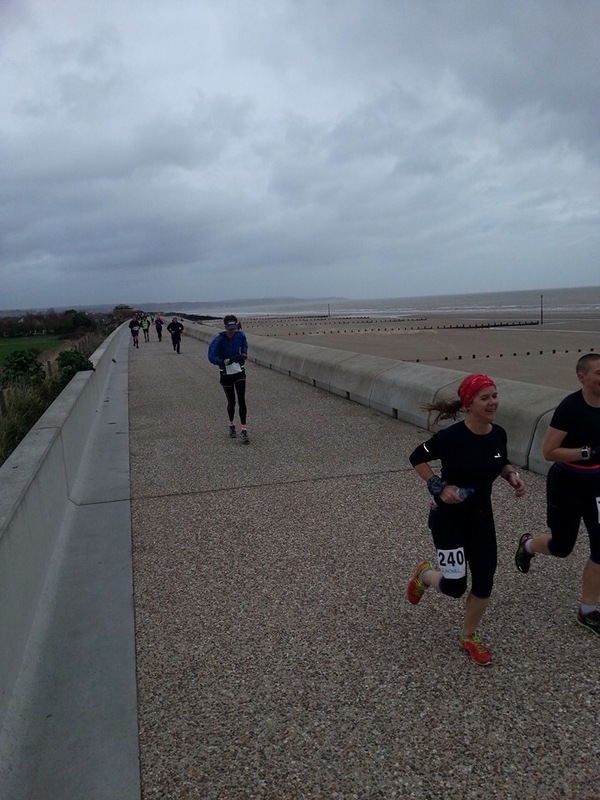 Many thanks to Saxon-Shore for a brilliant, friendly low key marathon. It was perfectly flat, mud free and uncrowded. I liked the laps, although after a few I was questioning whether I had passed a very large rock in the middle of the sea wall ot not. 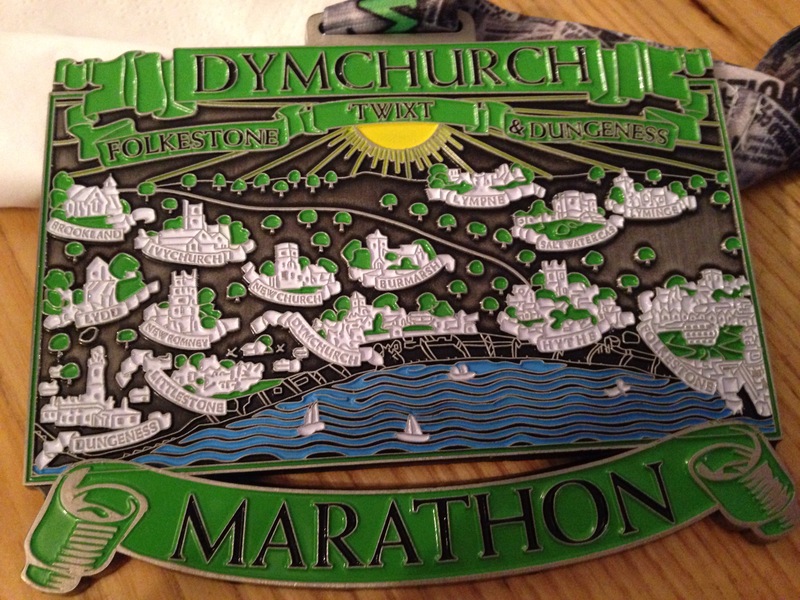 Categories: Race report, running | Tags: Dymchurch Marathon, Marathon | Permalink. Well done, hope you have booked another one already! Oh no, ”ran (practically) all the way’ – was that until I stopped you for a hug? Well done, again. Amazing achievement! Wow! 20 mins is awesome especially in the conditions. What is your secret? I think I once won first man with 3 day old stubble who’s nearly forty wearing a blue shirt and a watch on his right wrist who had weetabix for breakfast and who knows all the words to Paul Simon’s ‘you can call me Al’. It wasn’t recognised with a prize at the time but I’m pretty sure I had that category nailed.